OVER 62% of Northern Ireland’s schools would lose money from their annual budgets if controversial Department of Education plans to reform the common funding scheme are given the go ahead. The Detail has today published an interactive map which shows the impact the proposed changes would have on this financial year’s individual school budgets. Some schools would experience a financial windfall, while many others would lose tens of thousands of pounds. Budgets for 720 schools – in both the primary and post-primary sectors – would be cut while 424 schools would benefit from an increase. Over 80% of the total 832 primary schools would be worse off financially under the department’s proposals – compared to just a quarter of post-primaries. The changes proposed by the department aim to direct more funding towards pupils from socially deprived backgrounds with Free School Meal Entitlement (FSM) used as the current best indicator of social deprivation. After examining our data, Professor Tony Gallagher – former Head of the School of Education at Queen’s University in Belfast – said that the figures show the greatest increase in funding would go to Catholic schools in the primary, secondary and grammar sectors. Our analysis is based on data provided by the Department of Education relating to the 1,144 schools’ current budgets, how they would fare under the new proposals and also the percentage of pupils in each school entitled to free meals. The changes include having a separate funding formula for each school sector, the removal of VAT funding from the formula and an additional £10m targeted at social deprivation. The department provided us with new data for 89 schools in the grant maintained integrated and voluntary grammar sectors. These figures show the funding received by the schools this financial year with VAT removed. This allowed us to make a direct comparison with the estimated budgets they would have received under the proposed changes – which involve VAT being removed centrally before money is allocated to schools. We combined the various datasets provided by the department to create an interactive map showing all schools and the impact the changes would have on their budgets. The largest percentage increase would go to three maintained primary schools in Belfast who would all see their budgets go up by 15%. These schools are St Kieran’s Primary in Poleglass (83% of pupils entitled to free meals), St Bernadette’s Primary on Glenalina Road (93% of pupils entitled to free meals) and Holy Cross Boys’ Primary (78% free meals). These schools’ budgets went up by an average of £147,506. Aside from Garvagh High (which has closed), St Anthony’s Primary in Larne would be the biggest percentage loser under the new scheme – a 6% cut worth over £17,000. They have 31% of pupils entitled to free meals. The largest financial gain would be St Louise’s Comprehensive which would have an additional £292,600 (5%) added to its budget. Almost 41% of the pupils are entitled to receive free school meals. The largest financial loss would be suffered by St Colman’s Primary in Lisburn with an estimated budget cut under the new plans of more than £44,000. This would reduce this school’s budget by 5% from £973,346 to £928,934. This is followed Campbell College grammar in Belfast which would lose over £42,000 – a 1% reduction. Only 1.1% of pupils are entitled to free meals at Campbell – compared to 13.9% at St Colman’s Primary. The ‘winning’ schools would have an average of £37,000 more in their budgets if the proposed changes were already in place this year. 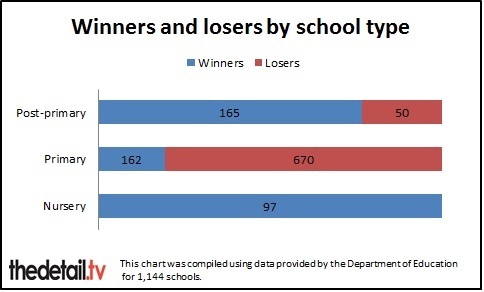 The ‘losing’ schools would face an average cut in their funds of just under £8,000. The school with the largest budget this financial year – and if the changes were implemented – is Methodist College in Belfast. It received £7,646,445 this financial year (less VAT). How would this year's budgets be affected by the proposals? Education Minister John O’Dowd proposed changes to the Common Funding Scheme in June and – despite calls for an extension – public consultation closes tomorrow (October 18) at 5pm. The proposals were brought forward by an independent panel of experts tasked with examining how funds are allocated to schools. Speaking yesterday, the Minister stressed that the changes aim to focus resources directly at tackling educational disadvantage. He said: “To date we have had over 2,500 responses to the consultation but there is still time for people to make their views known. In response to a written Assembly question last week, Mr O’Dowd said that the proposals would “target areas of highest need in an effort to try and break the clearly evidenced link between social deprivation and poor educational outcomes”. He also confirmed that there are more urban than rural schools and a higher percentage of pupils entitled to free meals in urban schools – so urban schools are therefore more likely than rural schools to gain funding under the new scheme. Actual allocations for the 2014-15 financial year will be notified to schools in the early part of 2014. Factors such as the increased Aggregated Schools’ Budget (ASB) for next year, overall enrolment levels, the number of Free School Meal Entitled pupils, and the number of Newcomer and Traveller pupils etc will impact on funding levels at individual schools. Professor Tony Gallagher is Professor of Education and former Head of the School of Education at Queen’s University in Belfast. We asked for his view on the department’s proposed funding changes. He said: “There is a persistent and damaging relationship between social disadvantage and educational performance, and that relationship is somewhat stronger in Northern Ireland than in many other jurisdictions. “The skewing of resources through the funding formula for schools on the basis of free school meal entitlement (FSME) has long been used as a key strategy for tackling this and the consultation proposals largely follow the recommendations of the Salisbury Report which suggested skewing resources still further. “While schools facing the most challenging circumstances undoubtedly require and deserve as much help as possible in meeting these challenges, at this point we have little concrete evidence on how funding allocated on the basis of FSME has been used directly to close achievement gaps. Prof Gallagher said: "These figures show the greatest increase in funding goes to the Catholic schools – primary, secondary and grammar – which gain an additional £7.6m. He continued: “The recent Audit Office Report on improving literacy and numeracy in Northern Ireland schools contained a wide range of recommendations, including the development of a ‘shared good practice culture’ across all schools, rather than simply the re-allocation of resources. The NI Audit Office report can be accessed here. To add your view to the consultation process, click here. Online submissions can be made. The deadline to submit is 5pm tomorrow. NOTE: The deadline has now been extended to 5pm on Friday, October 25. Final schools’ budgets announced by Education Minister John O’Dowd in March 2014 – read our report here.